Nelly Rosario is the author of Song of the Water Saints, which won a PEN Open Book Award. She is the recipient of the 2008 Sherwood Anderson Award in Fiction and a 2010 Howard Foundation Fellowship. Her fiction, nonfiction, and poetry have appeared in various anthologies and publications, including the New York Times, Meridians, and Callaloo. 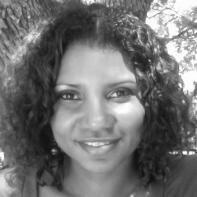 Rosario currently teaches fiction in the MFA Program at Texas State University and is at work on her second novel. Oh, the little glutton will experience the most miserable hunger after Antonio Santamarìa dumps her for culinary school. For now, let her feet point towards the altar. She fancies herself the happiest woman today, with new rules of engagement radiating on her ring finger, catching on the bed sheets. Warning: When Antonio learns of what's baking in her oven a month from now, he'll roll up his icing sleeves and pack up his pots and pans, cookbooks and spice racks, aprons and magazines, and that gourmet set of knives and chopping boards with which she once armed him for his birthday. Oh, how this generation is engorged by choices. Warning: Egg whites are beaten in meringue, protein hydrogen bonds broken. A wedding cake made by the groom himself will embarrass her parents, her brothers, the bride. “So whip-cream icing it is, then.” He never listens. She digs her face into his armpits. Instead of musk, she smells caramel, some cinnamon, perhaps nutmeg. Her own smell's not on his member, either. Just allspice and cloves. She craves saltiness, pain that can lead to even greater pleasure the way a dash of sea salt can temper coconut gelato. Later, in fact, she'll gulp tears on remembering the engagement dinner Antonio's cooked—tomato-cilantro bruschetta, devilled quail eggs, paper-thin slices of beef tenderloin in gorgonzola cream sauce over a bed of jasmine rice, guava flan brûlée, honey-dipped figs over coconut gelato. They both guzzled bottles of Tres Ojos Syrah 1975—their shared year of birth—that left both high on tryptophan and led them to this king-sized bed, where they stirred the batter of trouble in which she—and only she—will soon find yourself. Well into her first trimester as a single woman, she'll spend her days riding about the city, blowing viscous misery into packs of tissues and crossing her legs to quell a rabid urge to devour the world. Infinitely stronger will be this hunger than the one that has her presently on all fours, ready for her fiancé again. This generation knows not the exact measure of its hunger. By the second month of baking, her nose will have blown up to the size of a crab apple, varicose veins tattoo her calves with lavender rosettes. She'll see her need sitting on the F train one Friday. The man will be sticking the index finger of his left hand in and out of a Boston crème donut. She'll wad up her tissues and uncross her legs to watch how he hollows out the donut, sits back to pull the dough apart, licks its insides, then carefully stuffs the glistening pieces into his mouth. The cords of his jaw will tighten and loosen. His eyes will be closed, his meaty lips greased to perfection. He'll lick all ten of his fingers clean before concluding with a Wet Nap. She should climax now that Antonio's singing her blessed name, because one day she'll look at an ordinary man eating a stale donut on a stalled train and need him like she's never wanted before. Never you mind that the citrus scent of laundered bed sheets will make her dry heave. She'll be wearing Antonio's old cooking shirt, still reeking of today's engagement dinner. Her jeans will be unbuttoned at the point where the melon belly begins. Her neo-Afro will be tamed by the very bandanna now being used by her and Antonio in bed play: “Tony, you can lick counter-clockwise, too,” because, while he can handle her northern appetite, the southern one astounds him. She should not be so upset by his inability to give her that petite mort of hers—new life has just sparked. Sleep is best for now. She should listen well to a dream of a desolate island floating in an ocean of milk. “What an amazing donut,” she'll say when the F train pulls into Jay Street. “Must've been an amazing baker,” the man will say, and his licorice eyes will stray to her sunless hand, the same one digging into Antonio's buttery back mid-dream, in which he's incarnated as a Butterscotch Lifesaver. Together, she and the man will ride the escalator to the cloudy street. They'll both wait for the same bus in front of a bakery. The conversation will cover Boston crème versus French cruller, chocolate glaze versus old-fashioned, coconut versus jelly, and then the bus will come and they talk, and then the bus will come and they talk, and then her belly will tremble, and then she—and only she—will balk. She'll have to excuse herself, praying (to either the god who wants to abolish evil, and can't; or to the one that can, but doesn't want to; or to the impotent one that wants to, but can't; or to the wicked one that can but doesn't want to; or to the one that can abolish evil and truly wants to) that the bakery has restrooms. “Here. Call me sometime. We'll eat fried dough together. On me,” the man will say before being swallowed up by the B38. The bakery only allows customer use of its restrooms. Hence, she'll have to buy a Boston crème donut. In the restroom, after enlightened excretion, she'll surprise herself by also flushing away the telephone number and the donut. For now, Ms. Santamarìa-To-Be should rest easy and forget the future. She should love that Antonio's breath is sugar-plummed, even in milky sleep. At the very least, the little glutton should heed this advice without swallowing the hog whole.